Kaleidoscopes use light and mirrors to turn beads and jewels into an optical funhouse. But there's an easier way. You can actually turn any digital photo into a kaleidoscope. 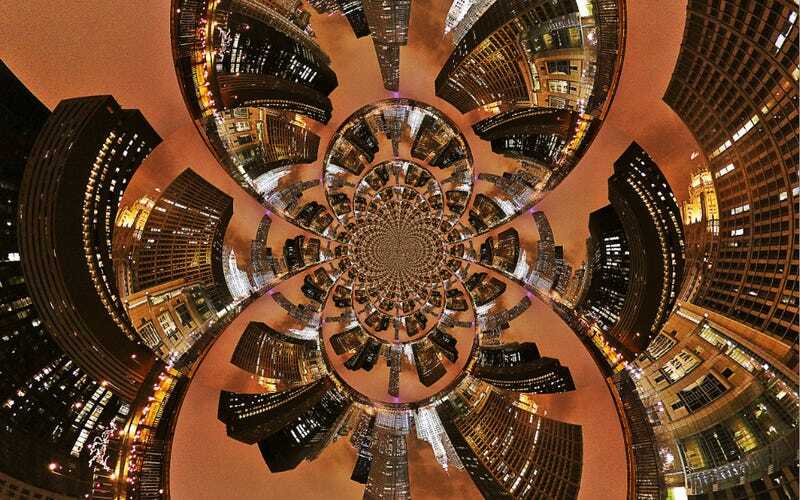 Take a photo and transform it into a kaleidoscope-esque image. Send us BOTH the original photo and the edited version. See what we mean in the instructions below. Second step, edit the photo. For step two, you have at least two decent options. The first is that you can use something like Photoshop to create the effect, pretty easily, by hand. The more creative amongst you can really personalize the design this way, too, optimizing the effect based upon your source imagine's geometries. The other option is to use a mobile app, of course. Either way, just create the most captivating kaleidoscope you can. Our lead image is by flickr's JFXie. It's of downtown Chicago, but note how the sky and buildings contrast to create a very cool abstraction. Look for polar elements like these in your source image. 5. Include THREE IMAGES THIS WEEK: a 970px wide source image AND your edited Kaleidoscope image (200KB or less) AND a natively sized (bigger) Kaleidoscope image in email. I know that your photo may not fall into those exact high rez dimensions, so whatever native resolution you're using is fine. KaleidoscopeWallpaper.jpg (2560px wide) naming conventions.